It is widely accepted that Ca2+ is a universal signaling molecule in the cell (Pozzan et al., 1994). Due to the versatility of Ca2+ signaling both, Ca2+ storage and release must be tightly controlled in spatiotemporal manner (Petersen and Burdakov, 1999). While several organelles participate in control of Ca2+ homeostasis, the endoplasmic reticulum (ER) appears to be the most important organelle controlling many aspects of intracellular Ca2+ homeostasis (Pozzan et al., 1994; Meldolesi and Pozzan, 1998). 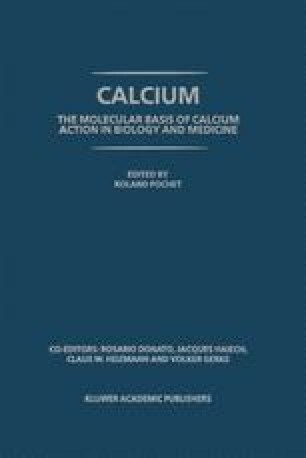 Ca2+ is released from the ER by InsP3 receptor and/or RyR Ca2+ release channels and it is taken up by the sarcoplasmic/endoplasmic reticulum Ca2+-ATPase (SERCA) (MacLennan et al., 1997 and Parys et al., this book). Alterations in the intracellular and ER lumenal Ca2+ concentration regulate a variety of diverse cellular functions including secretion, contraction-relaxation, cell motility, cytoplasmic and mitochondrial metabolism, protein synthesis, modification and folding, gene expression, cell cycle progression and apoptosis (Pozzan et al., 1994). The ER is a site of synthesis of membrane proteins, membrane lipids and secreted proteins. It contains the largest concentration of chaperones involved in protein folding, modification and assembly. The ER and its lumen contain a characteristic set of resident proteins that are involved in every aspect of the ER function. It is also likely that Ca2+ plays a role of signaling molecule in the ER lumen. The ER lumenal Ca2+ concentration ([Ca2+]ER) affect several processes in the ER lumen including modulation of chaperone-substrate and protein-protein interactions Corbett et al., 1999).